We have recently launched a brand-new website. For existing customers, we have unfortunately been unable to transfer your details. To use our new site, simply create a new account. PLEASE NOTE: Your sign in details for our old site will NOT work. We understand that this is a bit of extra work, so as a thank you, enter the code LAUNCH10 into the Discount Code box in the cart or during checkout to receive 10% off your order. Why do I have to register my pet’s details? 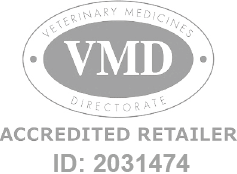 Certain products on our website are licenced veterinary medicines. This means our qualified staff must ensure that they are suitable for use before dispatch. For this, our staff must have certain information about your pet, such as weight, age etc. Products that require you to provide pet details are marked with a purple paw print. Once you have registered your pet’s details they are saved within Your Account. You can make any changes to your pet’s details here. Why am I having trouble completing my order? To future proof our website we have used the very latest technology in its creation. Unfortunately, this does mean that occasionally the website is not compatible with older versions of internet browsers.